In addition, note our list of HowTo's that provide very precise and short descriptions of a specific task in the SmartMDSD Toolchain. If you only want to try things out but do not want to touch your system, please use the Virtual Machine setup. Even though you can follow all tutorials with the virtual machine, we recommend to setup an own enviroment for tutorial levels „advanced“ and „experienced“. For people just getting in touch with our tools. Basic robotics knowledge is a plus. For full fledged users who want to apply all parts of the SmartSoft World. For the full user and robotics experts who want to understand, deeply apply, exploit, and eventualla contribute to the SmartSoft World. This lesson guides you through the SmartMDSD Toolchain and software development environment to get an overview and comfortable entry. The effort to follow these tutorials is fairly low since we provide a virtual machine image (virtual machine appliance) with everything set-up and ready-to-go. How to download the virtual machine, how set it into operation, and where to look around. Explore and run a simple obstacle avoidance robot in simulation. Explore and run a more complex system in simulation: the flexible navigation stack that that is in use with real-world service robots. How to develop a simple Laser Obstacle Avoidance component. Also available as video tutorial. Compose a simple laser obstacle avoid system with the Pioneer P3dx robot and the Player/Stage simulator. This lesson describes how to deploy software components to real-world robots. In the examples, we use a Pioneer P3DX robot. We use the previously developed system (Pioneer P3DX navigation) to deploy it on a real robot. We extend the system that was developed in Developing Your First System: Composing Software Components to make it work on real robot. We focus on the differences between deployment for simulator and deployment for real-world. This lesson describes how to use the SmartMDSD Toolchain with the OPC Unified Architecture (OPC UA). More specifically, the lesson describes how to model and use a Mixed-Port Component for OPC UA. This tutorial describes how component supplier models a mixed port software component with a plain OPC-UA port to communicate with a OPC UA enabled devices. This tutorial composes the mixed-port component together with other software components to a system. This tutorial shows how to develop a mixed-port component with an Plain OPC UA Server Port (ReadServer). This expert-level lesson describes how to access ROS nodes from the SmartMDSD Toolchain, i.e. how to use an existing ROS subsystem with the SmartMDSD Toolchain. More specifically, the lesson describes how to model and use a Mixed-Port Component for ROS. This tutorial describes how to compose systems from regular software components and mixed-port components that encapsulate a whole ROS subsystem. This expert-level lesson describes everything you need to get started with the SmartMDSD Toolchain and Raspberry Pi. We will use the example of a LED-powered traffic light. 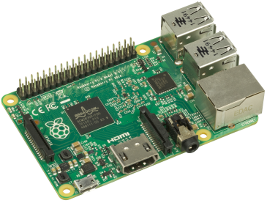 This tutorial provides Raspberry Pi specific installation instructions and general remarks to work with the SmartMDSD Toolchain and the Raspberry Pi. This tutorial describes how to develop software components using the SmartMDSD Toolchain. We use the WiringPi library to access the GPIO pins. This tutorial describes how to compose a system that runs components on the RaspberryPi and your development computer. This is a supplement to the Laser Obstacle Avoid and First Software Component Tutorials. It describes a set of additional worlds/environments for the Player/Stage simulator to test obstacle avoidance algorithms. See video tutorials of the v2-generation of the SmartMDSD Toolchain at YouTube. You can also find screencasts of the SmartMDSD Toolchain's first generation as of 2009 (outdated).